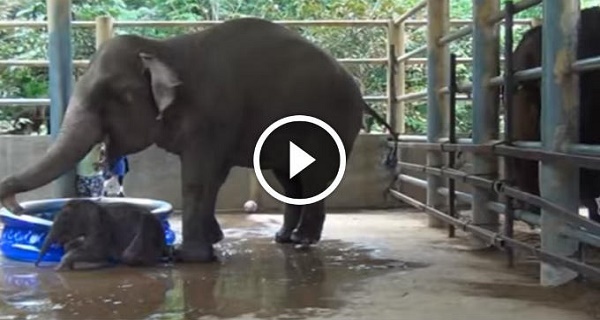 Baby elephant getting her first bath by Mom will put a smile on your face. SO CUTE! Home » Health » spirituality » Videos » Baby elephant getting her first bath by Mom will put a smile on your face. SO CUTE! Here we have amazingly adorable footage from the Elephant Nature Park in Chiang Mai, Thailand. This place is actually a rescue and rehabilitation center which is run by incredible caring, animal-loving, people.Here we see a very cute baby Navann who runs around in a kiddy pool and becomes as child-like and goofy as can be! Watch the little baby tromp around with mama in the pool as it will for sure put a smile on your face. Share this wonderful video with all of your animal loving friends and family!